The first is the mindboggling $5 million in signage Cuomo ordered and had installed across New York, touting the “New York State Experience.” Although the Federal Highway Administration said the signs are too much of distraction for drivers and could not be erected, Cuomo ordered them anyway, and then proceeded to have them installed. Now, thy have to come down. How much will that fiasco cost? The other is the one to keep the name of the Tappan Zee bridge intact, and thousands of New Yorkers have already petitioned Cuomo, who told the media said the public’s reaction is “personally hurtful.” When the first Tappan Zee Bridge was opened in 1955, former Governor Mario Cuomo dedicated it to former Governor Malcolm Wilson. 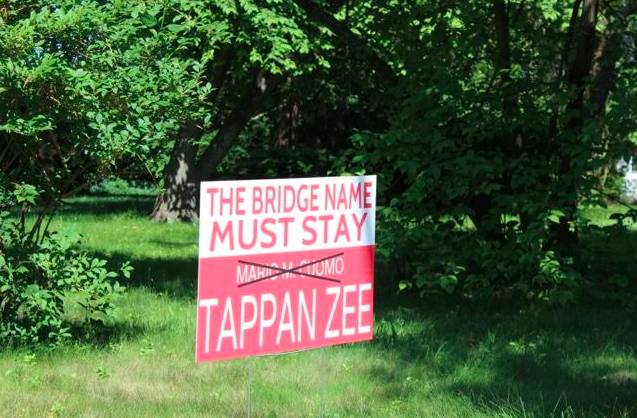 However, his son has decided to drop the “Tappan Zee” and name the bridge for his father. The bill passed at the 11th hour of the 2018-19 budget vote. Let’s hope common sense prevails in the renaming of iconic sites, including the Tri-Borough Bridge, which cost $4 million to rename to the RFK Bridge, certainly taking the meaning of the span to a new level since Tri-Borough implied its function—connecting the boroughs Queens, the Bronx and Manhattan.